Michigan has landed their third commitment in four days, as 2016 RB Kingston Davis committed to the Wolverines on Monday morning. Davis, who was in Ann Arbor for an unofficial visit this weekend, took to twitter to announce his decision. Kingston is a big bodied, strong running back that excels in running between the tackles. Standing at 6’1 and weighing 225 pounds, Kingston has all the physical attributes that a team would look for in a “down-hill” runner. Already looking the part of a college ready running back, Kingston has excellent speed and vision to go along with his huge frame. Davis does an excellent job of waiting for blocks to be set before accelerating through the line of scrimmage. Hits holes along the offensive line fast, and turns on the second burners once in the defensive backfield. A strong runner who will take multiple hits before falling down. Rushes to the outside well, due to his vision and ability to cut back to the inside. Doesn’t shy away from contact and will pick up tough yards inside the red-zone. Plays with a high level of athleticism and can beat his man to the sidelines, or up the middle. Changes direction very well, and can stop and make defenders miss with juke/stutter steps. Has the ability to catch the ball out of the backfield and pick up yards on screens or on flat routes. Kingston becomes Michigan’s fifth commitment in the 2016 recruiting class joining; OT Erik Swenson, LB Dele Harding, FB/LB David Reese, and QB Brandon Peters. 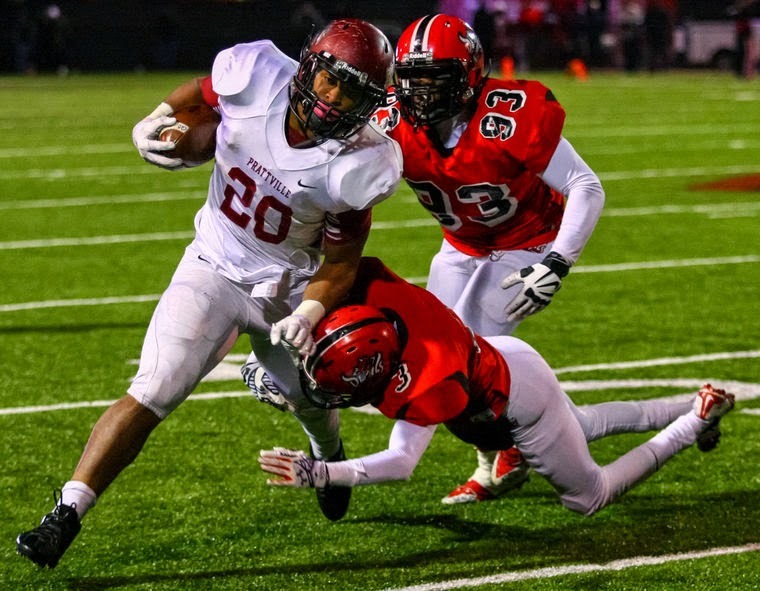 Kingston also becomes the second Prattville High School commit in two years, joining 2015 cornerback commit Keith Washington.